Masala coke is a very popular Indian Cold drink in Juice shops of Bangalore and Mumbai.I have tasted masala coke in a small juice shop in Gandhi bazaar. You can find varieties like masala Pepsi, masala Sprite, masala Thumbs up, lemon soda,Lemon cola, lemon ginger soda, paneer soda etc in the menu. 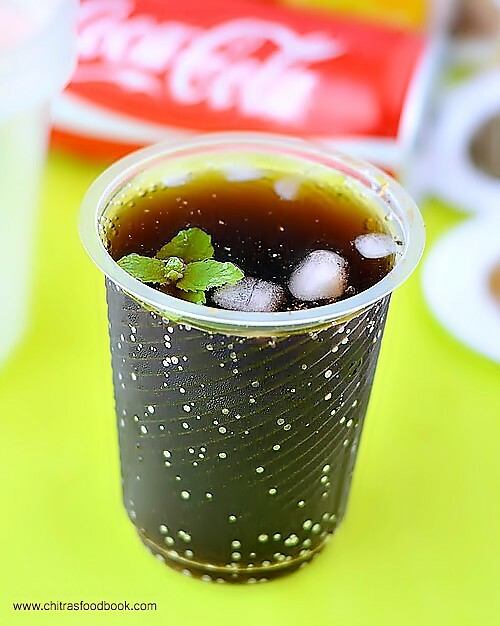 The recipe of masala coke is very simple & that is made with easily available ingredients.It can be quickly prepared in minutes by adding a lavish sprinkle of masala powders to Coke or Pepsi. When I saw the juice shop guy making it, I got tempted to try it at home. So I bought a can of diet coke & coco cola and tried it for myself and Sendhil. We enjoyed it thoroughly. It tastes more like jal jeera with the fizz of coke. 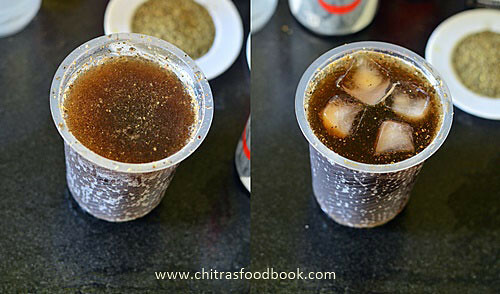 If you are concerned about drinking Coke or Pepsi, you can make the same with soda water and enjoy it as masala soda.Make and Serve during parties and get together during this vacation.I am sure everyone will enjoy this drink. 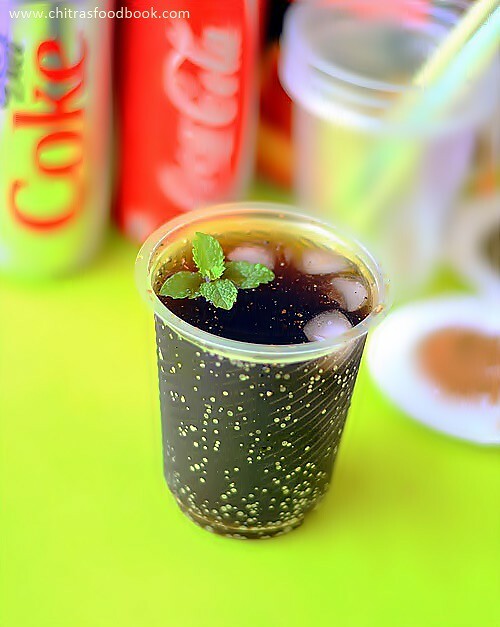 Lets see how to make masala coke at home. Check out my other Summer Drinks Recipes too ! In a serving glass, add all the spice powders, lemon juice given above. Add the coke little by little till 1/3 rd of the glass and wait till the bubbles/froth subside. Mix with a spoon.Add another 1/3 rd of glass and mix well. Repeat until the entire glass is full.Check for taste and add more chat masala, black salt & pepper powder, lemon juice as per your taste.Serve immediately adding some ice cubes.Garnish with mint leaves if you wish and enjoy !! 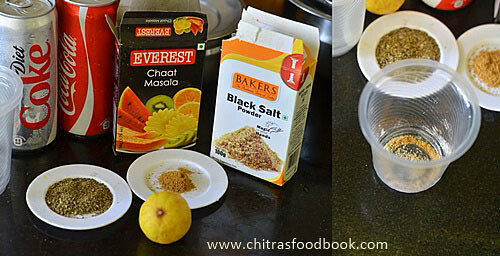 Adjust the quantity of masala powders based on taste. 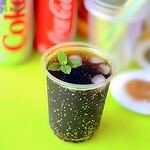 For variations, you can replace coke with diet coke, Pepsi, Thumbs up, Sprite or even Club Soda. If you have jal jeera powder, you can add that instead of chat masala powder & cumin powder. 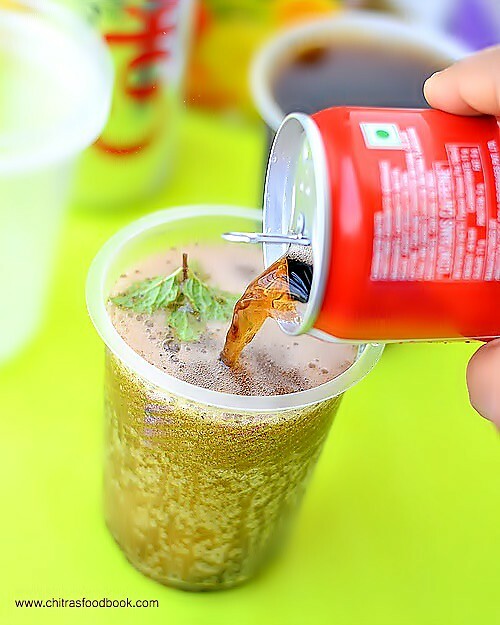 Enjoy this easy, yummy Masala coke/Pepsi at home during this summer vacation. You will love it !! Wow ! 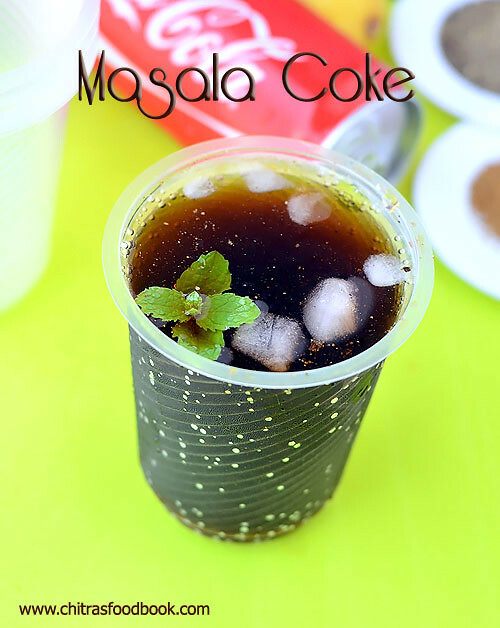 Masala Cola .... interesting recipe.